I had another topic I planned to write about this month, but the game got me excited about something else entirely. Instead I want to talk about villains. In regard to RPGs, I make assumptions about villains being recurring and powerful antagonists, but NPCs under full control of a GM. In a table top game, if a player takes on a character that actively doesn't get along with the other characters, undermines the GM's direction, maybe even kills other PCs, that player is a danger to the game and is usually ejected from the group or the whole game falls apart. I've play in some games where "evil" aligned characters are just not allowed. RPGs are social games and adding someone who is antisocial breaks the game. Again I find larp is a decidedly different beast than tabletop RPG. To think otherwise is a mistake that handicaps a game. Players fall into the habit of inaction, waiting for the GM, or plot, to introduce game hooks from the outside. They follow that line of plot, or they don't and sit bored and are inclined to break character because there's nothing to do or talk about. Even knowing this myself, my group has fallen into the trap. My players get along pretty well, socializing easily in character or out, and would be great table top players. They don't have… no… they avoid conflict with each other. To that extent, our current noble has turned the group into a fascist state and no one has raised a finger against her. It's pretty spooky, really, that everyone is afraid to stand up against her, to break with civility and risk a fight rather than cause the game in many ways to come to a halt. A more ideal situation would include players who are more keen to start trouble, to see how they can get a leg up on other characters, to be unabashed adversaries, or manipulate weaknesses, to test game boundaries. In short Villains. Already I retract with a sense of danger for my poor game. How far would villains try to go? Would they scare off the few players I have? Would they throw tantrums when their nefarious plans don't work just as they hoped? Mine constantly don't work out as a GM so why should they? How will they feel when they are ultimately defeated after a long drawn out dramatic story? Ultimately villains don't get to win, right? That's the way the stories all go. Maybe the fault is mine in making the game too safe for the risk averse. Maybe I'm risk averse, but I'm willing to discuss it. I've tried to extend the potential for special powers and wicked advantages to characters that seemed to want them, but they just didn't pursue them like I'd hoped. Should I have made it easier? I want to see how close to the edge I can get without the game breaking. Well… a little closer, anyway. And then there came our last game. It was a smaller attendance, but we did welcome a few new players who've had some experience in vampire larp before. 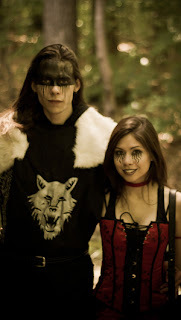 In VLarp games, characters are intentionally pitted against each other. 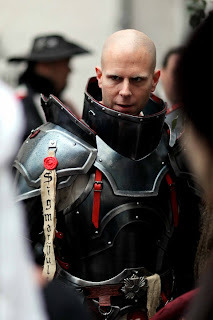 Breaking the other characters, and their plots and plans, all the things that would destroy a table top RPG are the fodder of VLarp. Now we may have three players with that sort of experience entering the game, testing our limits, vying for power. Just a few hours showed me they could stir things up, and breathe some new wickedness into the game. Already in my excitement I jumped the gun thinking one wanted to go full out evil, but we're working it out. I'm really looking forward to seeing what the next game sets off.